CHICAGO, Illinois, July 31, 2012 (ENS) – An oil spill from a broken Enbridge Energy pipeline in Wisconsin has been contained, the company says, but it could not have come at a worse time for the Canadian company, which is trying to get approval for new pipelines in Canada and the United States. The 1,200 barrel spill happened on Friday near Grand Marsh in central Wisconsin, population 127. Enbridge Control Center operators shut down and isolated the line and deployed emergency crews to the site. From its regional office in Chicago, the U.S. Environmental Protection Agency sent emergency response personnel to the site. The agency has established a Unified Command which includes representatives from EPA, the Wisconsin Department of Natural Resources, and Enbridge. EPA personnel have been conducting air monitoring operations and overseeing excavation of contaminated soil and vegetation at the site, as well as testing to determine whether the spill is adversely affecting groundwater. 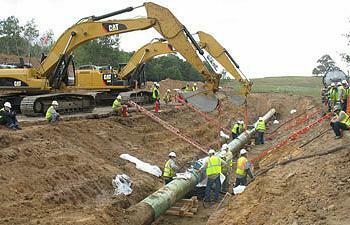 The 24-inch pipeline with capacity of 317,600 barrels per day was installed in 1998. It transports light crude oil to Chicago area refineries. The cause of the spill has not been determined and is under investigation. At this time, Enbridge does not have an estimated time for restart of the line. The Grand Marsh spill came almost exactly two years after an Enbridge pipeline ruptured on July 25, 2010, spilling more than 800,000 gallons into a tributary of Michigan’s Kalamazoo River. That spill, the largest tar sands spill in U.S. history, forced closure of 36 miles of the river. Enbridge displayed a more expedient response to the Grand Marsh spill than to the Kalamazoo River spill, which continued for 17 hours before the company shut the pipeline down. Pipeline regulators have proposed to fine the company $3.7 million for that incident. U.S. pipeline regulators said today that they have not decided whether or not Enbridge will have to take any corrective measures before restarting the Wisconsin pipeline. In May Enbridge announced that it will expand its crude oil mainline pipeline system to increase deliveries to refinery markets in the Upper Midwest, eastern Canada and, through connecting Enbridge pipelines, to the U.S. Gulf Coast. But Enbridge has been plagued with many recent spills from its pipelines. As recently as June 18, Enbridge spilled 60,760 gallons of oil in Elk Point, Alberta. That and the Wisconsin spill may make it more difficult for Enbridge to get support from the Canadian National Energy Board for its proposed Northern Gateway pipeline that would carry diluted bitumen from the Alberta tar sands to the British Columbia port of Kitimat. The BC government’s support for the controversial pipeline depends on the plan being approved by the Joint Review Panel of the National Energy Board that has been holding hearings across the province. “We need to combine environmental safety with our fair share of fiscal and economic benefits,” said B.C. Premier Christy Clark last week, setting forth five conditions for her government’s approval of the Northern Gateway pipeline. In the United States, the Wisconsin spill gives environmentalists more ammunition against Enbridge’s proposed pipeline projects as well as TransCanada Corporation’s Keystone XL pipeline currently undergoing environmental reviews by the federal and Nebraska governments.